I met Xavi soon after moving to Poblenou and wondered into his then small bookshop. He is not originally from this neighbourhood, but when he wanted to start in the book trade he checked the library statistics for the city and found Poblenou to be the area where most books are borrowed in libraries. Less than a year after opening he was already part of the local fabric. A professional from the marketing business, he used social media expertly to grow his clientele, but nothing seems to work better than the blackboard he props up by the door where he chalks the events and readings that will be taking place that week. In fact, when he doesn’t put it up, people come in and ask him why. It’s become a classic talking point around here. 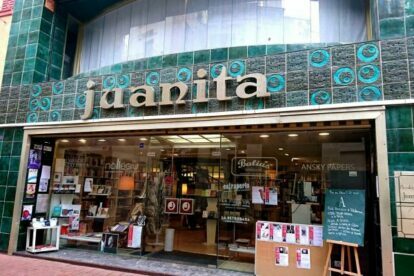 He soon moved to the vacated premises of La Juanita, an old and locally famous clothes store. When he made the move, he summoned his followers to form a human chain in order to move his stock through the two streets that separate the venues. Easily a hundred of us turned up, as well as Barcelona TV. The bookshop is more of a cultural centre where you can enjoy talks, readings and music or just order a coffee or a beer while you browse your favourite authors. If you fancy a chat, say hello to Xavi and you’ll be sure to have a great conversation.